THE PRESIDENT: Good morning, everybody. Please have a seat. Welcome to the White House. Of all the privileges of this office, none is greater than serving as the Commander-in-Chief of the finest military that the world has ever known. And of all the military decorations that our nation can bestow, we have none higher than the Medal of Honor. Even now, all these years later, Chuck is still defined by the humility that shaped him as a soldier. At 86 years old, he still looks sharp as a tack in that uniform. I pointed out he obviously has not gained any weight. (Laughter.) And his life is as American as they come. He’s the son of an immigrant. His father signed up to fly for the United States the day after Pearl Harbor and filled his five boys with a deep sense of duty to their country. For a time, he even served in the Army Reserve — for a time, even as he served in the Army Reserve, Chuck ran a Ford dealership with his brother. And to families who drove a new car off that lot, he’s the salesman who helped put an American icon in their driveway. So in a lot of ways, Chuck Kettles is America. And to the dozens of American soldiers that he saved in Vietnam half a century ago, Chuck is the reason they lived and came home and had children and grandchildren –- entire family trees made possible by the actions of this one man. We are honored to be joined not only by Ann, but also eight of Chuck and Ann’s 10 children, and three of their grandchildren. It’s the Kettles family reunion here in the White House. (Laughter.) We’re also honored to be joined by Chuck’s brothers-in-arms from Vietnam and some of Chuck’s newest comrades, members of the Medal of Honor Society. May 15, 1967, started as a hot Monday morning. Soldiers from the 101st Airborne were battling hundreds of heavily armed North Vietnamese in a rural riverbed. Our men were outnumbered. They needed support fast –- helicopters to get the wounded out and bring more soldiers into the fight. Chuck Kettles was a helo pilot. And just as he’d volunteered for active duty, on this morning he volunteered his Hueys –- even though he knew the danger. They called this place “Chump Valley” for a reason: Above the riverbed rose a 1,500-foot-tall hill, and the enemy was dug into an extensive series of tunnels and bunkers — the ideal spot for an ambush. But Chuck jumped into the cockpit and took off. Around 9 a.m., his company of Hueys approached the landing zone and looked down. They should have seen a stand of green trees; instead, they saw a solid wall of green enemy tracers coming right at them. None of them had ever seen fire that intense. Soldiers in the helos were hit and killed before they could even leap off. But under withering fire, Chuck landed his chopper and kept it there, exposed, so the wounded could get on and so that he could fly them back to base. A second time, Chuck went back into the valley. He dropped off more soldiers and supplies, picked up more wounded. Once more, machine-gun bullets and mortar rounds came screaming after them. As he took off a second time, rounds pierced the arm and leg of Chuck’s door gunner, Roland Scheck. Chuck’s Huey was hit. Fuel was pouring out as he flew away. But Chuck had wounded men aboard and decided to take his chances. He landed, found another helicopter, and flew Roland to the field hospital. By now it was near evening. Back in the riverbed, 44 American soldiers were still pinned down. The air was thick with gunpowder; it smelled of burning metal. And then they heard a faint sound, and as the sun started to set, they saw something rise over the horizon: six American helicopters — as one of them said, “as beautiful as could be.” For a third time, Chuck and his unit headed into that hell on Earth. Death or injury was all but certain, a fellow pilot said later, and “a lesser person would not return.” Once again, the enemy unloaded everything they had on Chuck as he landed –- small arms, automatic weapons, rocket-propelled grenades. A soldier who was there said “that day, Major Kettles became our John Wayne.” With all due respect to John Wayne, he couldn’t do what Chuck Kettles did. He broke off from formation, took a steep, sharp, descending turn back toward the valley -– this time with no aerial or artillery support — a lone helicopter heading back in. Chuck’s Huey was the only target for the enemy to attack –- and they did. Tracers lit up the sky once more. Chuck became — Chuck came in so hot that his chopper bounced for several hundred feet before coming to a stop. As soon as he landed, a mortar round shattered his windshield. Another hit the main rotor blade. Shrapnel tore through the cockpit and Chuck’s chair. And still, those eight soldiers started to sprint to the Huey, running through the firestorm, chased by bullets. Chuck’s helo, now badly damaged, was carrying 13 souls and was 600 pounds over limit. It felt, he said, like flying a two-and-a-half-ton truck. (Laughter.) He couldn’t hover long enough to take off. But cool customer that he is, he says he saw his shattered windshield and thought, “that’s pretty good air conditioning.” (Laughter.) The cabin filled with black smoke as Chuck hopped and skipped the helo across the ground to pick up enough speed for takeoff –- like a jackrabbit, he said, bouncing across the riverbed. The instant he got airborne, another mortar ripped into the tail, the Huey fishtailed violently, and a soldier was thrown out of the helicopter, hanging onto a skid as Chuck flew them to safety. I couldn’t make this up. (Laughter.) This is like a bad “Rambo” movie. (Laughter.) Right? You’re listening to this, you can’t believe it. 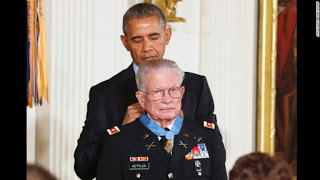 Bill, hearing the story, knew it was something more, and he started a five-year mission, along with Chuck’s son Mike, a retired Navy pilot, to award Chuck the Medal of Honor. Bill and Mike are here, as is Congresswoman Debbie Dingell who, along with her legendary husband, John Dingell, went above and beyond to pass a law to make sure that even all these years later, we could fully recognize Chuck Kettles’ heroism, as we do today. So we thank them for their outstanding efforts. And that’s one more reason this story is quintessentially American: Looking out for one another; the belief that nobody should be left behind. This shouldn’t just be a creed for our soldiers –- it should be a creed for all of us. This is a country that’s never finished in its mission to improve, to do better, to learn from our history, to work to form a more perfect union. And at a time when, let’s face it, we’ve had a couple of tough weeks, for us to remember the goodness and decency of the American people, and the way that we can all look out for each other, even when times are tough, even when the odds are against us — what a wonderful inspiration. What a great gift for us to be able to celebrate something like this. It might take time, but having failed to give our veterans who fought in Vietnam the full measure of thanks and respect that they had earned, we acknowledged that our failure to do so was a shame. We resolve that it will never happen again. It can take time, but old adversaries can find peace. Thanks to the leadership of so many Vietnam vets who had the courage to rebuild ties, I was able to go to Vietnam recently and see a people as enthusiastic about America as probably any place in the world -– crowds lining the streets. And we were able to say that, on a whole lot of issues, Vietnam and the United States are now partners. Here at home, it might take time, but we have to remember everyone on our team –- just like Chuck Kettles. Sometimes we have to turn around, and head back, and help those who need a lift. Chuck says the most gratifying part of this whole story is that Dewey’s name, and Roland’s name, and the names of the 42 other Americans he saved are not etched in the solemn, granite wall not far from here that memorializes the fallen in the Vietnam War. Instead, it will be Chuck Kettles’ name forever etched on the walls that communities have built from Southern California to South Carolina in honor of those who have earned the Medal of Honor. MILITARY AIDE: The President of the United States of America, authorized by Act of Congress, March 3rd, 1863, has awarded, in the name of Congress, the Medal of Honor to Major Charles S. Kettles, United States Army. Major Charles S. Kettles distinguished himself by conspicuous gallantry and intrepidity while serving as flight commander, 176th Aviation Company, (Airmobile) (Light), 14th Combat Aviation Battalion, Americal Division near Duc Pho, Republic of Vietnam. On 15 May, 1967, Major Kettles, upon learning that an airborne infantry unit had suffered casualties during an intense firefight with the enemy, immediately volunteered to lead a flight of six UH-1 Delta helicopters to carry reinforcements to the embattled force and to evacuate wounded personnel. Enemy small arms, automatic weapons, and mortar fire raked the landing zone, inflicting heavy damage to the helicopters. However, Major Kettles refused to depart until all helicopters were loaded to capacity. He then returned to the battlefield with full knowledge of the intense enemy fire awaiting his arrival, to bring more reinforcements, landing in the midst of enemy mortar and automatic weapons fire that seriously wounded his gunner and severely damaged his aircraft. Upon departing, Major Kettles was advised by another helicopter crew that he had fuel streaming out of his aircraft. Despite the risk posed by the leaking fuel, he nursed the damaged aircraft back to base. Later that day, the Infantry Battalion Commander requested immediate emergency extraction of the remaining 40 troops, including four members of Major Kettles’ unit who were stranded when their helicopter was destroyed by enemy fire. With only one flyable UH-1 helicopter remaining, Major Kettles volunteered to return to the deadly landing zone for a third time, leading a flight of six evacuation helicopters, five of which were from the 161st Aviation Company. During the extraction, Major Kettles was informed by the last helicopter that all personnel were onboard, and departed the landing zone accordingly. Army gunships, supporting the evacuation, also departed the areas. Once airborne, Major Kettles was advised that eight troops has been unable to reach the evacuation helicopters due to the intense enemy fire. With complete disregard for his own safety, Major Kettles passed the lead to another helicopter and returned to the landing zone to rescue the remaining troops. Without gunship, artillery, or tactical air support, the enemy concentrated all firepower on his lone aircraft, which was immediately damaged by a mortar round that shattered both front windshields and the chin bubble, and was further raked by small arms and machine gun fire. Despite the intense enemy fire, Major Kettles maintained control of the aircraft and situation, allowing for the remaining eight soldiers to board the aircraft. In spite of the severe damage to his helicopter, Major Kettles once more skillfully guided his heavily damaged aircraft to safety. Without his courageous actions and the superior flying skills, the last group of soldier and his crew would never have made it off the battle field. Major Kettles’ selfless act of repeated valor and determination are in keeping with the highest traditions of military service and reflect great credit upon himself and the United States Army. 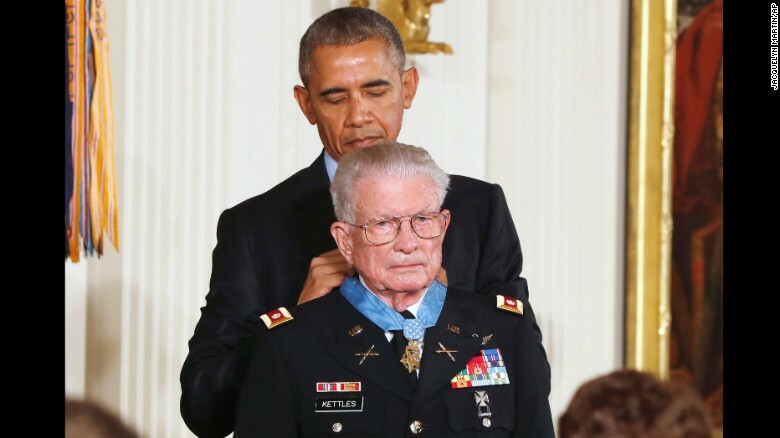 Vietnam War Hero and Medal of Honor recipient Master Gunnery Sergeant Richard A. Pittman has died.